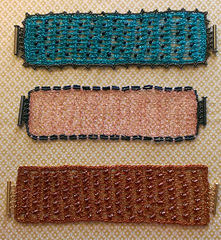 These simple cuffs make for great gifts and use up a thread and beads you have lingering in your craft room. 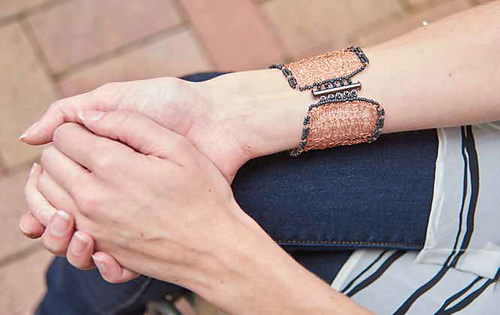 You can grab almost any thread or wire and some beads and turn it into a great cuff. I love mixing crafts so by adding a touch of beading on the edge of the cuff it just steps up the polished look slightly. Anyway you decide to cook up your own, I know they will look great. Wire Version Shown: Artistic Wire, 30gauge wire (bare copper; 50 yd 46 m/ spool]): 25yds. Aqua Version Shown: Nazli Gelin, Garden 10 Metallic (99% Egyptian giza mercerized cotton, 1% Glitter Yarn; 306 yd 280 m/ 1.75 oz 50 g): #702-25 Mint with Turquoise, 1 ball. Pumpkin Version Shown: Nazli Gelin, Garden 10 Metallic (99% Egyptian giza mercerized cotton, 1% Glitter Yarn; 306 yd 280 m/ 1.75 oz 50 g): #702-20 Caramel with Bronze, 1 ball. Hook: Size No. 0 (2.55mm) Steel hook for wire version, F/5 (3.75mm) for aqua version, E/4 (3.5mm) for pumpkin version or hooks needed to obtain gauge.